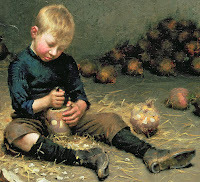 This young chap (look at the bottom of his shoes!) 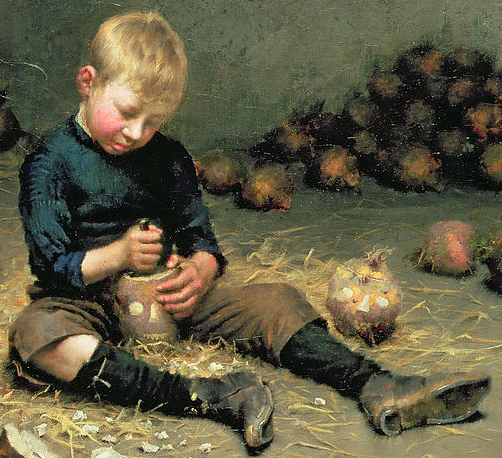 is carving large turnips in the British artist Edward Docker's work "Making Lanterns." Directions stressed to not cut through the rind so the candlelight could be seen through the face design, but the wind would not blow it out. 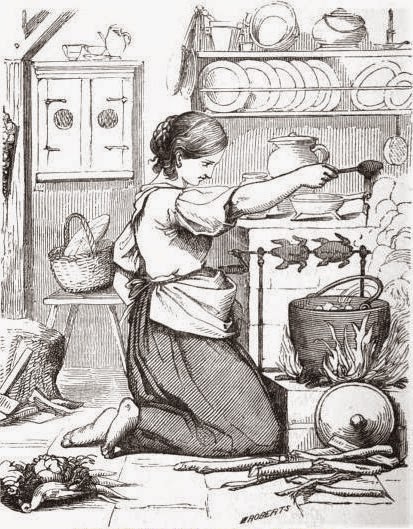 In this 1854 poem Peggy, the cook, starts the fire an hour before sunrise to fry the cakes (pancakes, hoecakes?). After breakfast and cleanup, she starts roasting some fowl or a haunch of meat... which has to be turned. and turned. Then, there is a pudding. By the end of day, and the poem, she is "in such a toast" that "You scarce could tell which's done the most. Myself, or what I roast!" Ever had that feeling after a day at the hearth? or brick oven? or... at home in the kitchen before a holiday or big dinner? 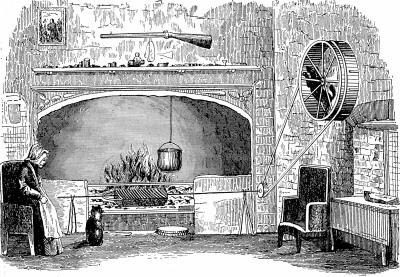 Were guns kept above the fireplace? During an 1856 flood at Malvern, UK (some of us can relate) one gun kept on hooks on the kitchen chimney floated away and was replaced by chairs as the water receded. and a couple other examples. Suet (the fat around the kidney - generally beef) was clarified or rendered down - slowly cooked then strained - to make tallow "...for pie-crust, for basting and soups, as well as for frying." Recipes from an 1828 Scottish book and two Jewish manuals.